Reading lists and how to wrangle them #1: What to read first? Reading lists and how to wrangle them #2: To buy, or not to buy? A quick picture about my current silly state of affairs. Not scanned because why buy a scanner and scan things nicely when you can just take bad photos on your phone. You could also add ‘desire to draw pictures about this’ to the list. This entry was posted in Kirsty rants about PhD stuff and tagged books, chapter, computer, History, I have a horrible cold, Poseidon, technology. Bookmark the permalink. 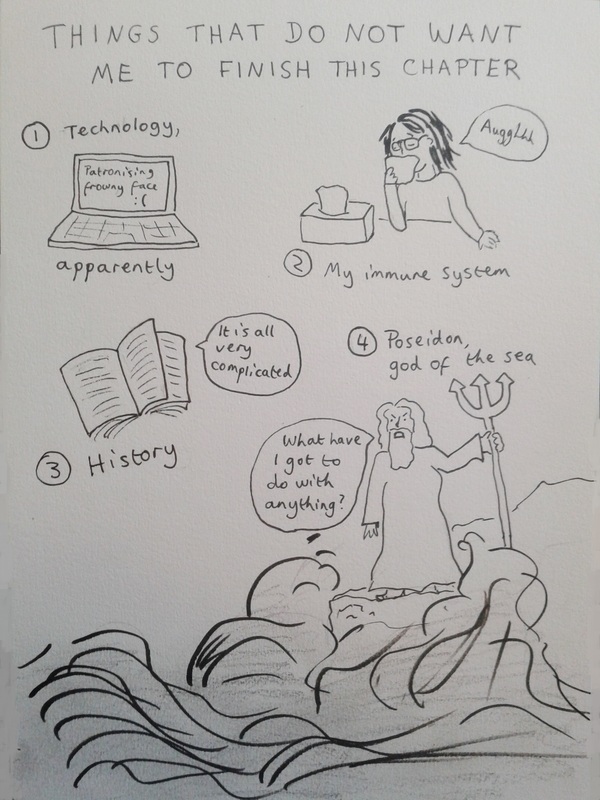 Could do you do a drawing of a Lord Kitchener-style Poseidon going “Poseidon Wants YOU… to finish your thesis!”? Haha YES I have to do this! Roll up, roll up: AtB portraits to benefit Nepal!